Today began much like the others- a fabulous breakfast (croissants, eggs, nutella, yogurt, fruit, cafe au lait, etc) followed by a proper coach bus. 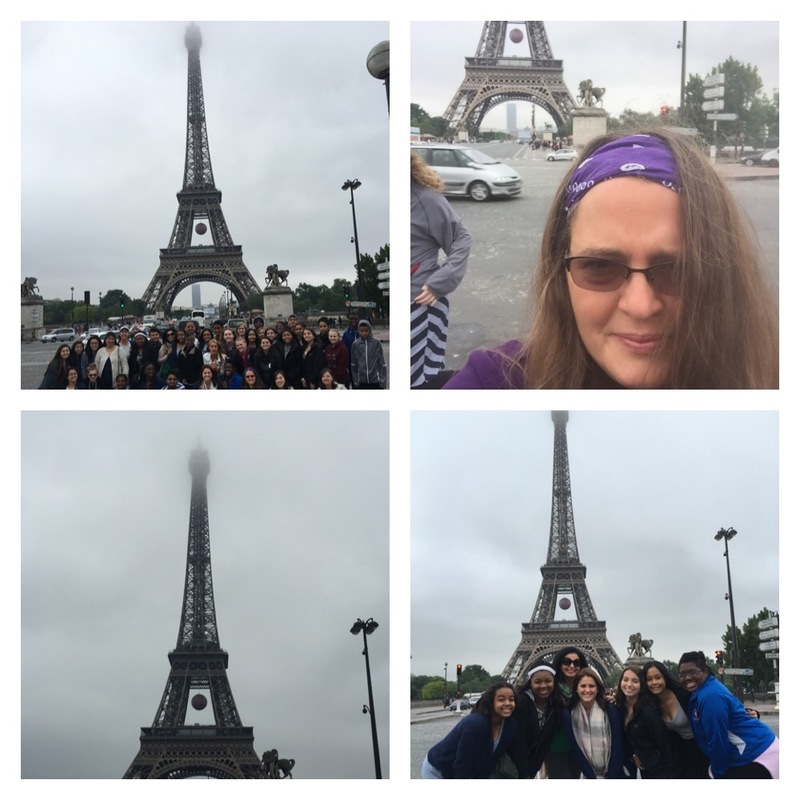 This morning , at 9am sharp, we went on a city bus tour of Paris with tour guide Anne. I really liked her, and she knew the little “Oh, Champs Elysees” song that I started singing as soon as we neared that famous French Rue! The tour was all things informative, humorous, and scenic. We passed by some definite “must see” locals, and were given some great vignettes about folklore, history, and architecture. The first part of the tour included the home of Quasimoto, perhaps better known as Notre Dame Cathedral; we didn’t get out, since we will tour the church on Friday. After passing Paris’s oldest street, Saint Jacques, as well as the Sorbonne and the High School of Victor Hugo, we drove by the Pantheon, which is the place where famous intellectuals go to be “panthenized”. The list of these heroes was long, but I remember her mentioning Hugo, Braille, Marie Curie, Dumas, and Voltaire. We drove past the Observatory of Paris, the Tuileries (pronounced “twilleries’) Gardens, and the Louvre. 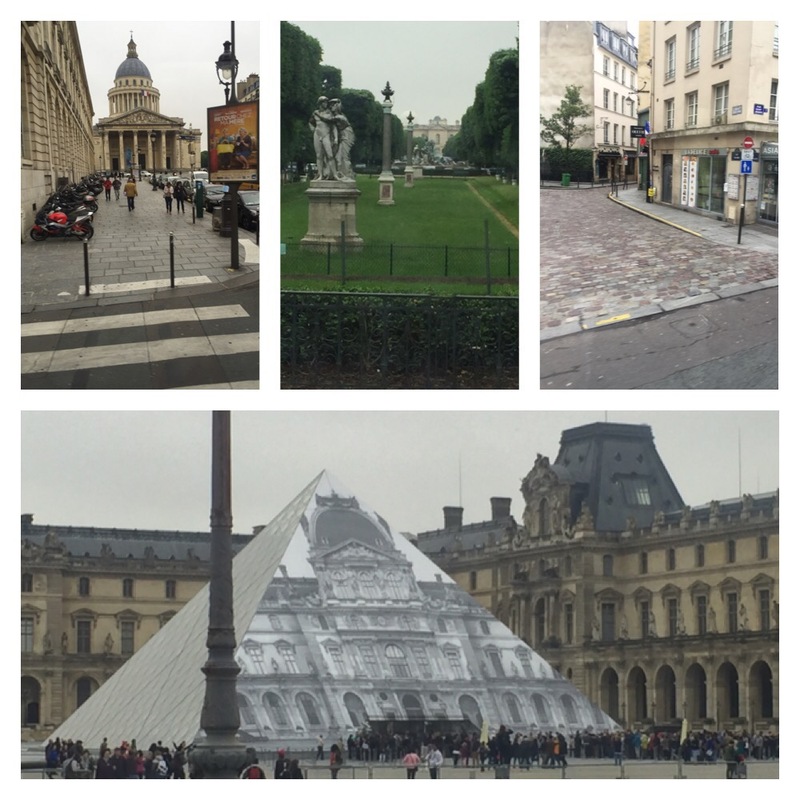 We were able to see the “modern” pyramid entrance to the Louvre- it was hard to miss- it seemed highly incongruous with the rest of this massive medieval art museum. Our next stop took us down the Champs Elysees all the way to the Muses D’Orsay, which is the art museum home to the likes of Degas, Monet and many others. We passed La Petite Palais as well as Le Grand Palais. We also passed Les Invalides, perhaps most easily distinguished by it’s black roof. This place was protected by two guards, both with machine guns at their sides, which was not suprising since it is a military museum. Our stop at the Eiffel Tower was amazing. I don’t think anyone ever tires of looking at the Eiffel Tower- all 1000 feet of it. I bought a replica of it, but rather than 1000 feet, which makes it the tallest tower in Paris, mine is rather Liliputians. I wandered down the Champs Elysees. The kids were to meet me at the Rue de la Paris (aka the giant Ferris Wheel in front of the Tuileries Garden). 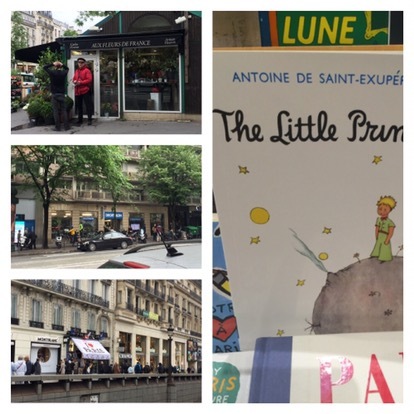 I enjoyed the looking at the shops, stores, and people that I passed by as I sauntered down the famous French street. 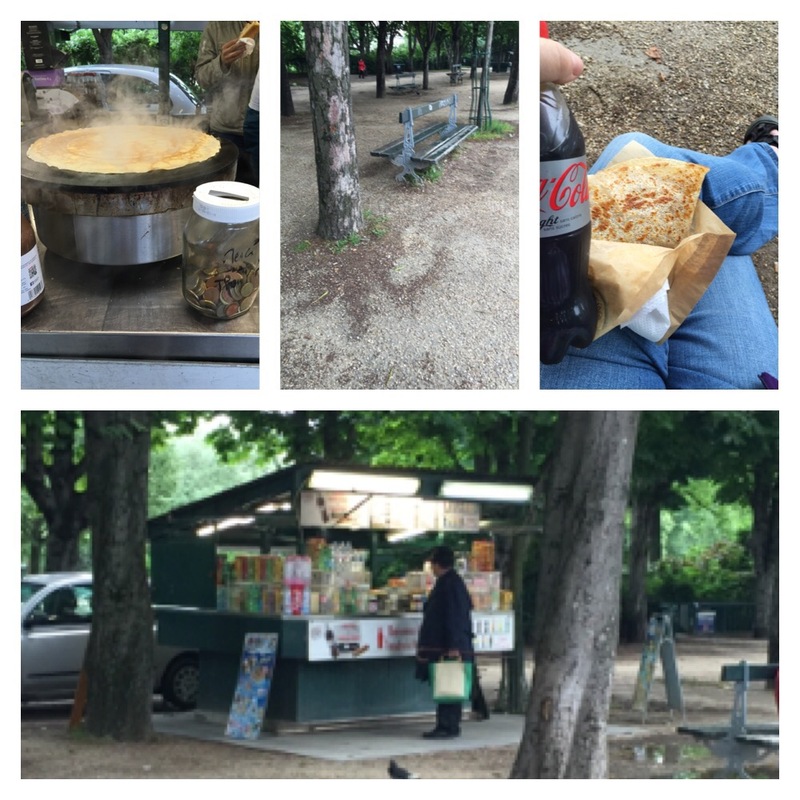 I stopped just inside the Place de la Concord to enjoy a crepe avec boerr et sucre. Ooh la la! It was amazing. After lunch, I met the kids back at the Ferris Wheel, and we all agreed that going up in it was a wonderful plan. We paid the 12 euros and got in. 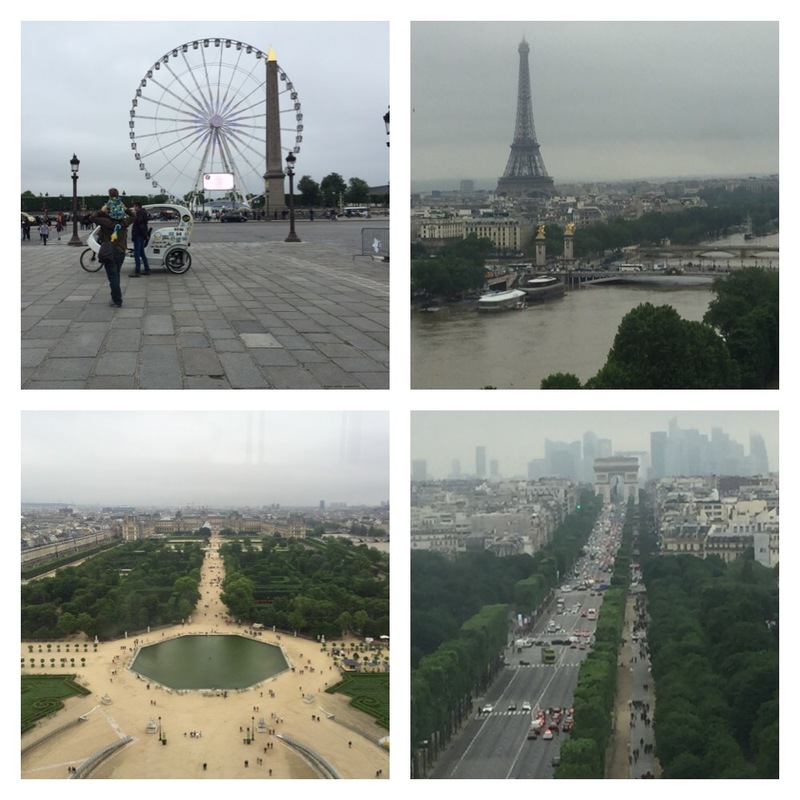 It was a fabulous view of both Tuileries Garden and the Eiffel Tower. The remainder of the afternoon was spent wandering my way back to the Opera where I planned to meet the rest of the group. 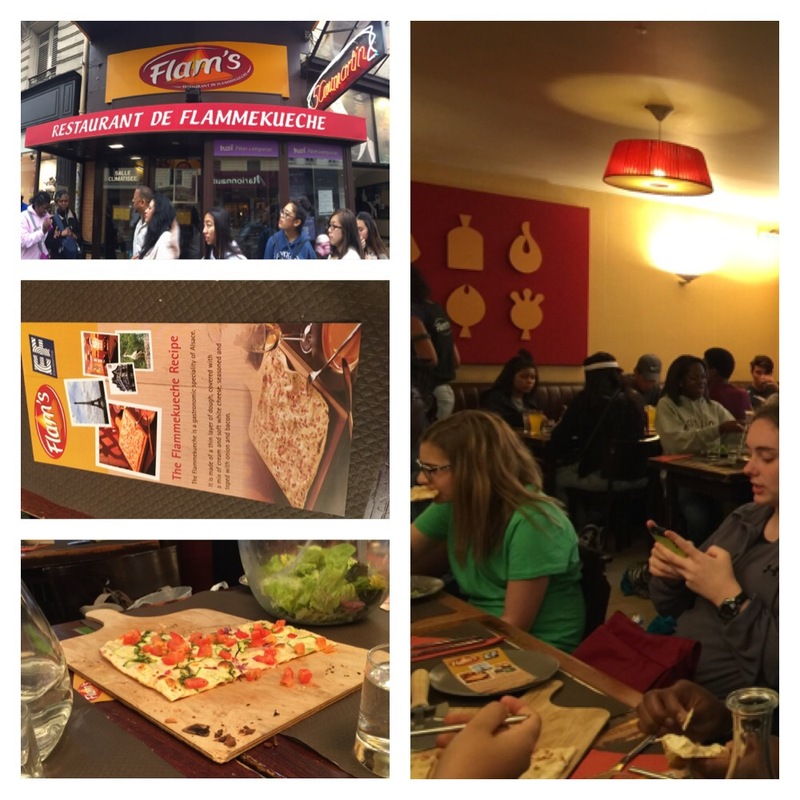 Once we were all corralled, we went to dinner at a very unique pizza place called Flam’s. Here we had salad and unique thin pizza – all we could eat. Since they segregated us by carnivores and vegetarians, I sat across from one traveler, part of our tour but not our group- who we have aptly dubbed the ice queen. She criticized the cuisine from beginning to end- so much so that I nearly chucked my vegetarian ways to the curbside in order to eat cows and pigs with with more jolly company! 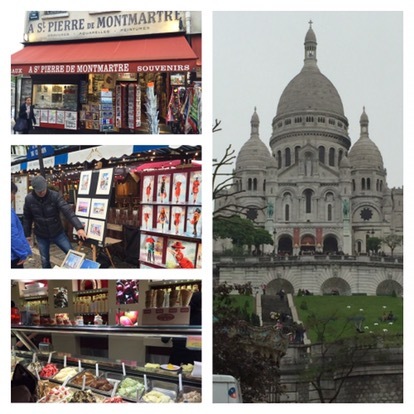 After dinner we made our way to Montmartre, home of the awe inspiring Sacre Coerr Cathedral. We had an hour to explore the local art scene at the top, enjoy some gelato, and visit the church. We made it back to the hotel by 11pm- the kids were exhausted and I had walked nearly 25,000 steps!